Zoom H4n Pro vs H5 Portable Handy Recorder: Let's Settle This Now! A handheld audio recorder is a handy gadget to have whether you partake in pro-audio recording, podcasting, voice note-taking or you just like to record things around you.The market for these devices has grown significantly over the past few years. So the choice is wide. The Zoom Corporation makes some really great recorders such as the Zoom H4n Pro and the Zoom H5 Handy recorders. Choosing the right one for you can be tricky. In this article, we'll try to make that process easier for you by sharing our views of the devices. The Zoom H4n Pro and Zoom H5 have distinct physical designs. The Zoom H4n Pro is slightly bigger in all dimensions; width, height, and depth. The H4n is also slightly heavier at a weight of 10.37oz against the H5’s 6.21oz. The lighter weight and smaller dimensions of the H5 make it marginally more portable than the H4n Pro. The Zoom H4n Pro has a rubberized body which makes it comfortable to grip. The XLR/TRS connector bay has a locking mechanism to keep your cables secure and avoid accidental disconnection. All the main controls are on the front of the panel and self-explanatory hence making the device easy to use. The Zoom H5 doesn’t have locks on the XLR connector bay so you ought to be careful when dealing with cables as an accidental disconnection can interrupt a recording session. There are rotary dials for adjusting levels, unlike the Zoom H4n. The body is crafted from a mix of plastic and rubber, resulting in a pretty robust product. It doesn’t hurt to use a protective casing when moving around with these kinds of devices though. Both gadgets can be mounted on a stand or tripod in their native state. They can also be mounted on a DSLR using an HS-01 Hot Shoe adaptor which you have to get separately. The Zoom H5 and the Zoom H4n Pro have more similarities than differences. Both are capable of recording up to four tracks simultaneously. They also come with the ability to overdub and punch-in audio. Both units also have two XLR/TRS combo ports with phantom power so you can connect studio-grade condenser microphones directly if you wish to do so.A 1/8” stereo line output is present on both devices which enables you to directly route the audio into another input device. So you can mount a Zoom recorder on your DSLR and use it as a shotgun mic of sorts.The built-in speakers are identical. Each has a mono speaker with a rating of 400mW and impedance of 8 Ohms. Both the Zoom H4n Pro and Zoom H5 feature unidirectional onboard condenser mics with a sensitivity of -45 dB, 1 kHz at 1 Pa.The onboard software navigation is not very different for the most part. They both allow you to control the panning and volume of each individual track prior to creating a stereo or mono mixdown. Both units also have a compressor and limiter onboard to enable you to carry out some basic audio processing tasks straight from the respective devices without a computer. By plugging in either the Zoom H5 or the Zoom H4n pro into your computer you get a 2-input/2-output audio interface. This interface can be accessed by your DAW enabling you to record audio into your computer and monitor it using the 3.5mm headphone jack. Both can support an SDHC card up to a maximum of 32GB. Feature-wise, the two recorders are almost identical save for the fact that the H4n Pro has some onboard effects which the Zoom H5 doesn’t have. The Zoom H5 has backup recording and changeable microphone capsules which the Zoom H4n Pro doesn’t have. The Zoom H4n Pro and the Zoom H5 both have the same high fidelity mic preamps which make for superb audio recording. Each of the preamps has a -20dB pad for controlling the input signal level. The preamps offer low-noise recording and are capable of recording/playing audio at high resolutions up to 24-bit/96kHz. Even quiet sound sources are recorded with minimal artifacts. The onboard stereo microphones on the Zoom H4n Pro are adjustable between 90 to 120 degrees, allowing you to capture sound from various directions. This is not the case with the Zoom H5. However, the performance of these built-in mics on both units is virtually identical on both devices. However, despite the similar preamps, the Zoom H5 has more flexibility due to the swappable microphone capsules it features. Some of the expansion capsules are exceptional. Most notable of these is the XYH-5 capsule which is a shock-mounted mic that captures stereo sound sources in outstanding detail. The capsules alone are reason enough to buy the Zoom H5 if you are someone who likes to experiment with different mics for different situations. 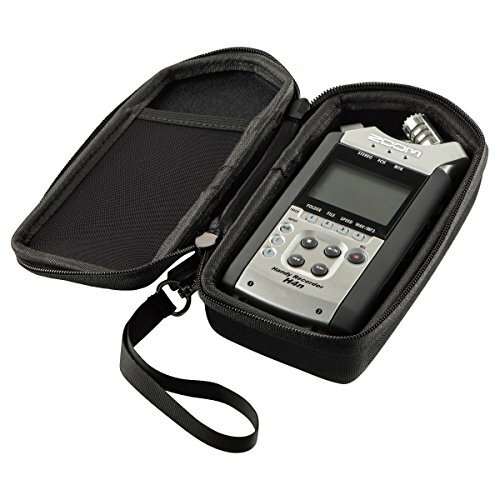 However, if you are a podcaster for instance who records in the same environment and you just need your voice to be heard clearly, then the Zoom H4n Pro is more capable of delivering than H5 For the best quality lossless recordings, you should use record in WAV format, which is supported by both units. However, if disk space is a concern to you then you can always opt to record in stereo 320kbps MP3 format. As an overall recorder, the Zoom H5 is the more versatile of the two devices because of the interchangeable mic capsules. It allows you to optimize the device's sound recording capabilities based on the situation. The Zoom H5 also has a backup recording feature which records your sound source at a level 12dB lower than your configured input level. This backup goes to a separate file which can be used in case the original recording was too loud. This adds a level of operational robustness to the device which the Zoom H4n Pro doesn’t have. However, the Zoom H4n Pro is probably better for working on music because it has onboard vocal, guitar and bass modeling effects. These effects would probably not be of much use to a podcaster, journalist or someone who just wants to capture clean, no-frills audio. But to a musician, these effects can be used in creative ways. The two recorders are very portable because they use ordinary AA batteries, so you don’t have to worry about charging. You can simply grab the device, get on your way and buy batteries at the convenient store. There’s no competition between the two devices when it comes to battery life though. The Zoom H5 is the clear winner. It can last up to 15 hours on a pair of AA batteries while the H4n Pro lasts from 6 to 10 hours. Running out of juice in the middle of a recording session can be a real pain, but switching out batteries is easy. You just have to be more mindful when going into marathon recording sessions on the Zoom H4n Pro. At the end of the day, your choice of recorder should be based on the one you feel meets your needs. Both the H4n Pro and the Zoom H5 are really good choices. The Zoom H5 was designed to be an improved version of the H4n Pro albeit with a different physical design, better battery life and interchangeable mic capsules, which can come in handy for audiophiles or in specific use cases. Regardless of which one you choose, both recorders perform the core function of recording high-quality audio very well thanks to the high-fidelity mic preamps. So you will be in great hands whether you choose the Zoom H4n handy recorder or its big brother, the Zoom H5 handy recorder.